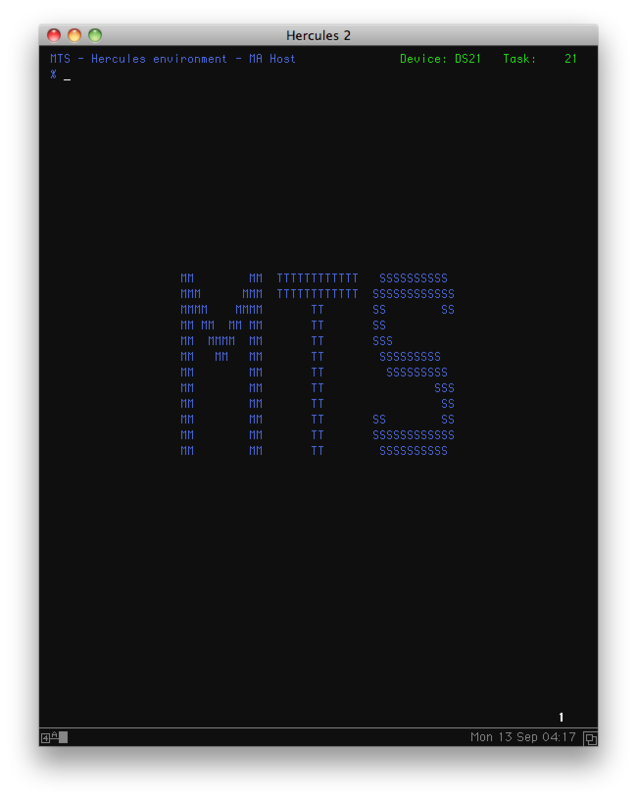 You can read about the history of MTS here, but I wanted to show a little of MTS running today on my MacBook Pro laptop. The version of MTS I am using is not generally available, so this entry begs the question of how to make it so. That question has no simple answer as I write this, but we're working on it. To run MTS you need to obtain an IBM S/370 mainframe or one of the derivatives of that family of mainframes. Luckily, this is a lot easier than it used to be. Hercules is an open source software implementation of the mainframe System/370 and ESA/390 architectures, in addition to the new 64-bit z/Architecture. Hercules runs under Linux, Windows (98, NT, 2000, and XP), Solaris, FreeBSD, and Mac OS X (10.3 and later). This discussion shows a little of MTS running under Hercules on my MacBook Pro laptop. Until we find a way to distribute MTS, there's no point in covering the details of how I managed this (that'll come later), so this first part is mostly "show and tell." 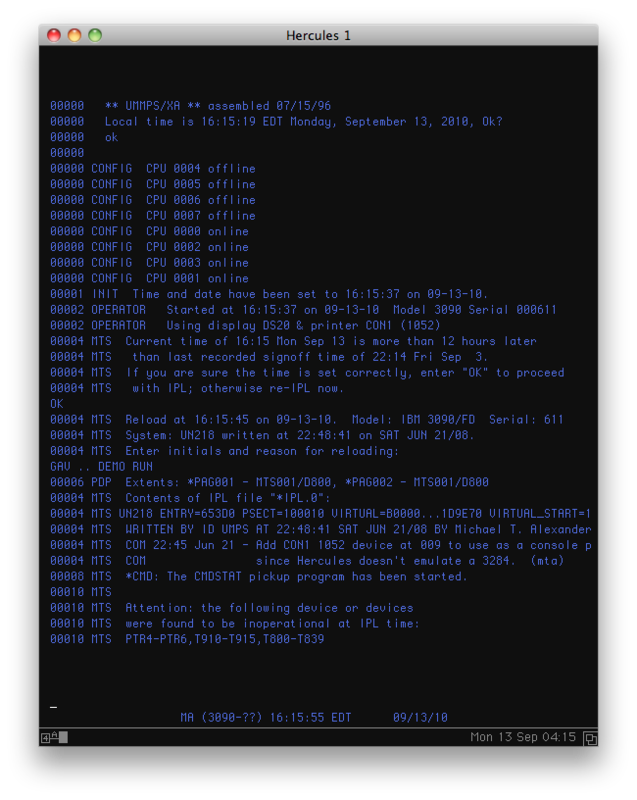 Hercules is run from the command line, reads a configuration file which describes the available (emulated) hardware and waits to be IPL'd. 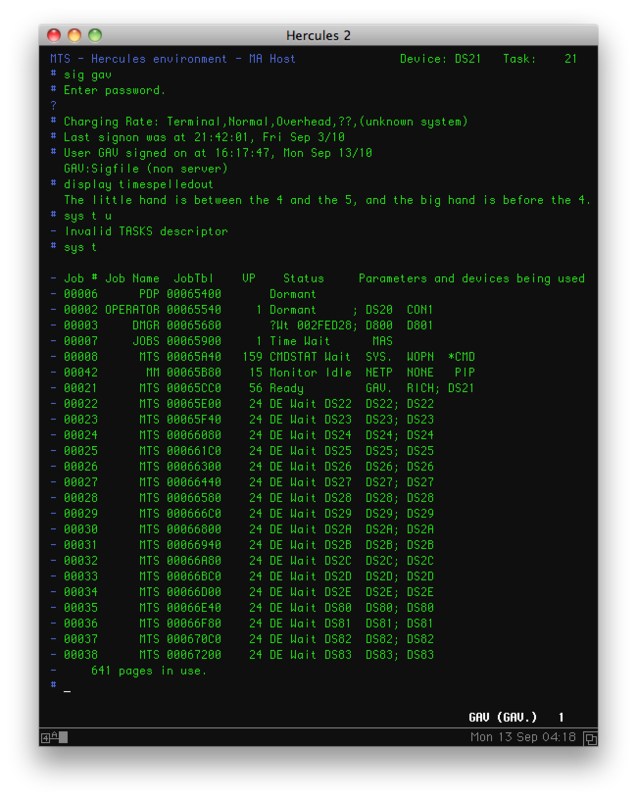 Once the initial program is loaded, and started, it proceeds through a sequence of steps, managed from the operators console, till enough of MTS is running to allow terminals to be enabled and offer access to the interactive service.